If you are looking for masses of yellow flowers on upright stems then Chrysocephalum semipapposum could be the plant for you. And especially if you want a plant that is drought tolerant. 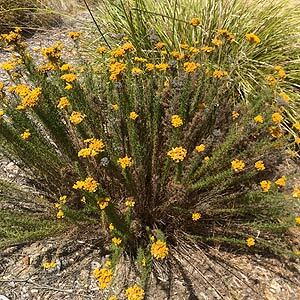 Also known as the ‘Clustered Everlasting’, Chrysocephalum semipapposum (syn. Helichrysum semipapposum) is a member of the Asteraceae family. A clump forming perennial with oblong leaves on long stems from 1 – 2m in height. Appearing from spring to autumn, the flowers form as large clusters of golden yellow on the ends of the stems.? This is a widespread species with populations found in each Australian state. 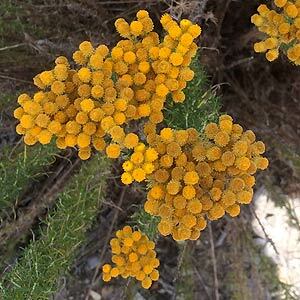 Often associated with coastal areas where it grows well in the sandy soils as an understory plant.? A well drained soil and a sunny to part shaded position suits well, although this is a hardy and adaptable plant. In the garden Chrysocephalum semipapposum can be pruned back hard in winter to promote strong new growth and tidy up the old foliage. Propagation from seed is easy, seed should be collected when dry and should be germinated in Autumn. Plants can also be propagated from cuttings.